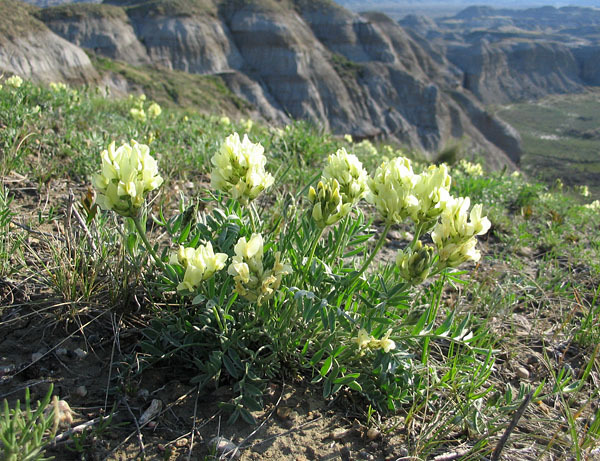 I arrived at 8 am, travelling northeast from Brooks across the flat farmland of southern Alberta. Out past Patricia, past the horse farms and the last of the irrigation machines, the land begins to drop away. 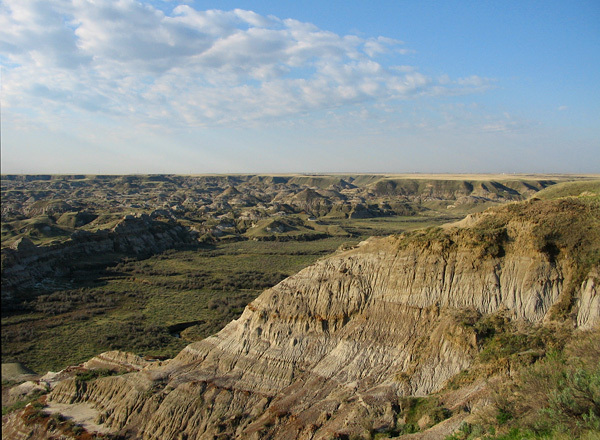 Over a rise, a lookout on your right presents the wonderful panorama across the valley badlands, with the Red Deer River at the bottom. Anyway, the rest of the camera looked OK to me, and it still seemed to be taking reasonable photos. It was only later that I would discover that any image taken under angled light would suffer from interesting (and not necessarily “good interesting”) effects. I shot many photos while I was in the park. Only a few would turn out to be presentable for general consumption. Down the slope there were vehicles at the visitor centre and campground, but once I got out into the park proper I found it abandoned. It is wonderfully strange to be absolutely solitary on the trails at a major tourist site, on a perfect morning under the bright sun. When I am alone, I tend to move quickly without realizing it. Time slows when there is no one to discuss things as they appear, and observations that actually take a split second appear to crawl past in slow motion. 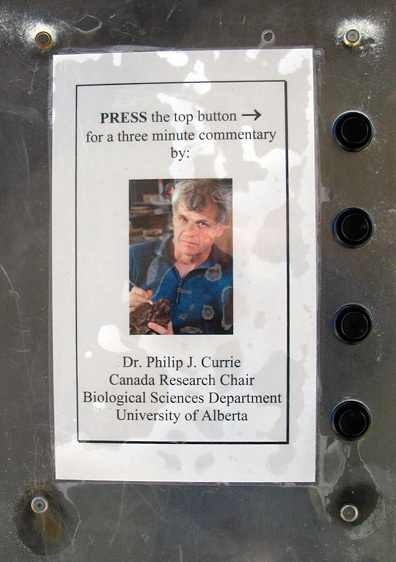 Philip Currie is omnipresent at DPP. I found these listening stations particularly entertaining because we had just had Phil give an excellent presentation at our Great Canadian Lagerstätten conference session two days earlier. I walked the well-tended gravel path of the “Trail of the Dinosaur Hunters”, a gentle stroll to a fossil quarry of Barnum Brown’s, dating from the early days of dinosaur excavation in this area. 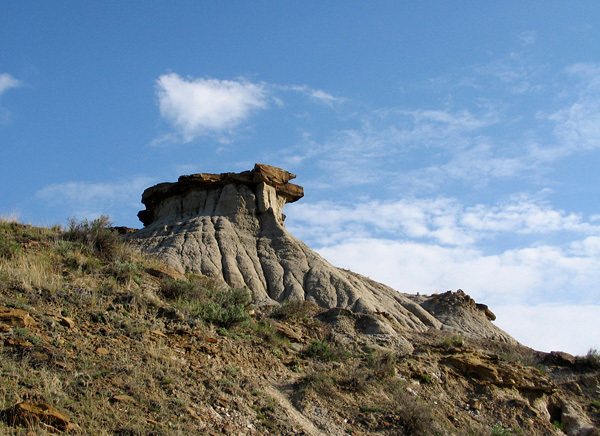 The Dinosaur Park Formation and other Cretaceous units of southern Alberta are incredibly rich in dinosaurs and a great variety of other fossils; this place is the epicentre of Alberta’s dinosaur abundance and diversity. Many years ago I spent some happy weeks collecting dinosaurs northeast of here, so my eye is reasonably attuned to finding dinosaur fossils. 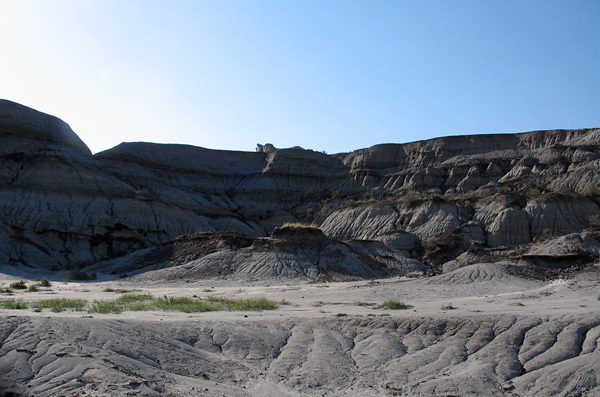 Since the park is so rich in fossil material, my objective was to not see fossils, but to simply observe the rocks and the landscape. Collecting is forbidden, and I didn’t want to have to fight the natural reflex to pick up any piece of bone that I might happen to come across! By 9 am I had already completed a second trail. This was a lovely meandering wander through the cottonwoods and sages down by the river. The sign at the beginning indicated that it could take an hour to complete, but this would clearly have been an hour with speed set at “slow amble,” maybe punctuated by breaks for lunch, a nap, and a quick game of blackjack. Heading up to the visitor centre, I was pleasantly surprised to discover that the exhibits had been completely refurbished since my last visit. I was given a tour by the manager, who explained how the development had taken place. 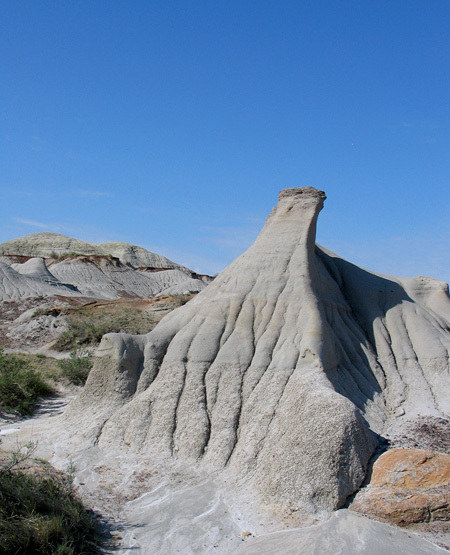 The front end, which was put together by the park in collaboration with a design firm, includes some excellent visual explanations of badlands phenomena. 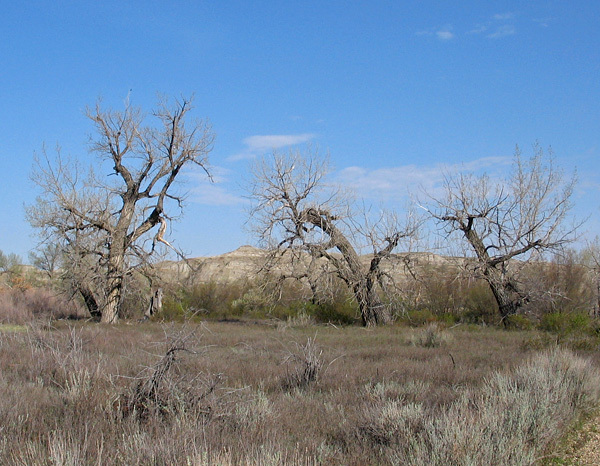 At the back of the centre are the dinosaur exhibits, developed by the Royal Tyrrell Museum of Palaeontology in Drumheller. These are really Tyrrell exhibits in miniature, and include some superb specimens such as a skull of Styracosaurus. My only quibble was that there now seem to be fewer fossils than there were before. The previous exhibits had some wonderful examples of how specific bones vary between dinosaurs, but of course a design team can never fit every possible feature into a limited space. The visitor centre has some lovely exhibits. 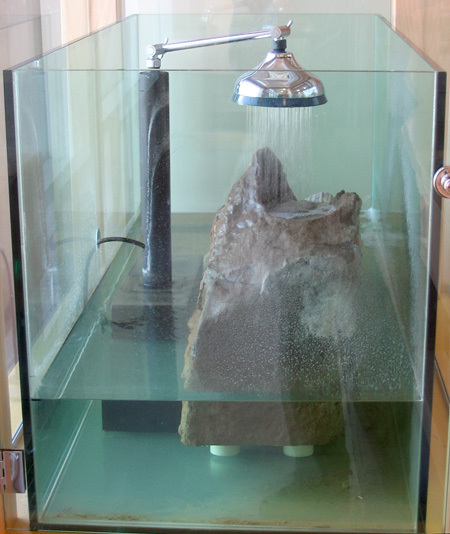 This case dramatically demonstrates the erosion of soft sandstones by flowing water. Small theropods (Saurornitholestes?) 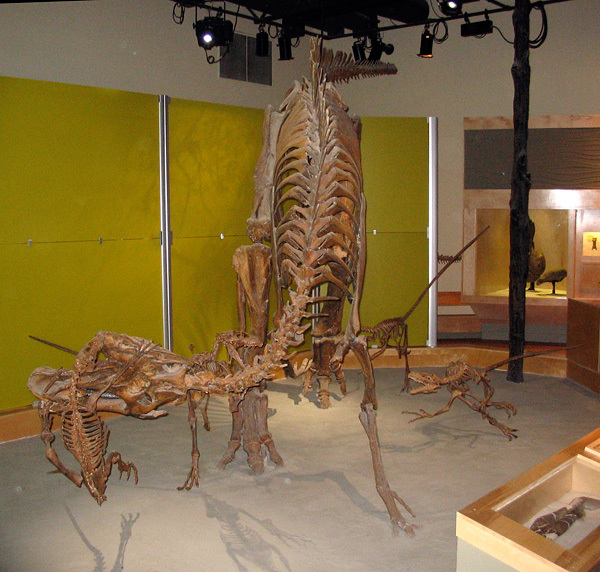 attack a hadrosaur in this exhibit at the visitor centre. The mounts are very good, but I find it psychologically troubling to contemplate several skeletons attacking another skeleton. This exhibit has a horror movie just waiting to get out! 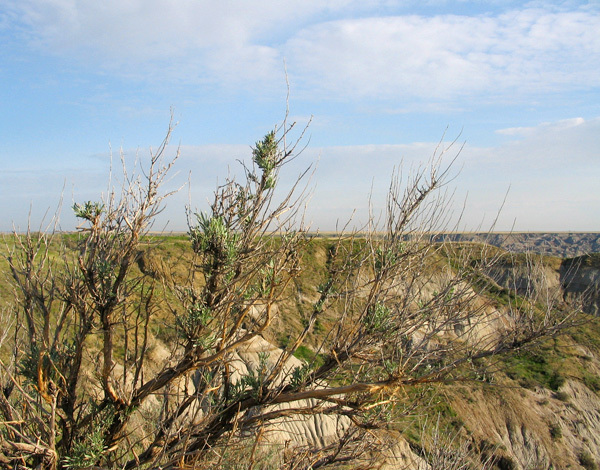 Behind the visitor centre, a sign indicates the presence of the Coulee Viewpoint walking trail. I noted that the sign warned of “steep slopes,” but I was still surprised just how precipitous some of them turned out to be, after the gentle paths elsewhere. This route was only sporadically marked with little signs, which demonstrated that you would have to scramble up and down across sandstone, ironstone, and popcorn shale. Having done badlands fieldwork before, I found that I adapted quickly, but I did wonder whether having this trail directly behind the visitor centre might tempt those clad in loafers or stilettos into places where they could really regret their choice of footwear. It was a dry day when I was there, so navigating the rills and gullies was relatively straightforward. My recollection of wet popcorn shale slopes elsewhere is that they are far more challenging, since they are about as easy to scramble up as a tilted board coated with lukewarm lithium grease (they are, however, remarkably easy to descend, as long as you don’t care where and how you stop). Over the top of the slope, a pair of Canada Geese on either side of a coulee warned me in no uncertain terms that they were nesting nearly. If that was true, I did wonder about their sanity, since this seemed the most ill-thought goose nesting site I had ever seen (on consideration of this sentence, however, I realize that this may be redundant: Canada Geese probably never do anything that could be described as “well-thought” or “planned”). Thanks for the detailed look at DPP. 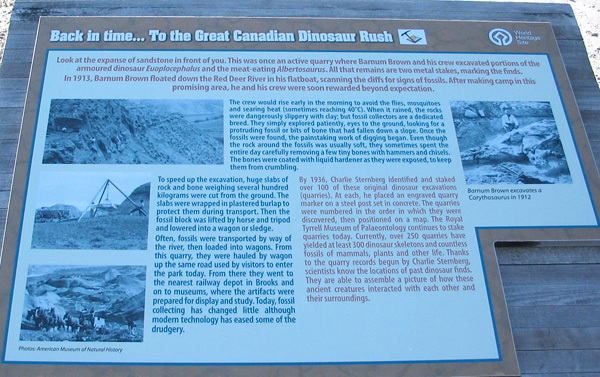 We’re headed there shortly, part of a dino-themed vacation we are doing from Calgary to Eastend. Nice to see the pics and know a bit about what to expect. Thank you. I think you will have a great time – the Tyrrell, DPP, and Eastend are all wonderful places, and well worth the visit!